"Fantastic for groups of golfers - and their families. 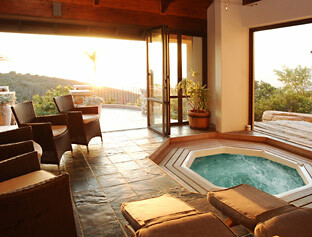 Stunning location, bags of space, excellent bar, jacuzzi & rock pool. Good discounts on golf at Pezula & Simola. Sleeps 12: 3 double bedrooms, 2 bunk rooms, 1 twin. Whether youre a golf addict or not, you wont fail to be impressed by the superb facilities, equipment & location of the Eagle's Nest. Perched high above the Knysna lagoon, this huge property is located on the exclusive Pezula golf estate, offering total privacy and security. 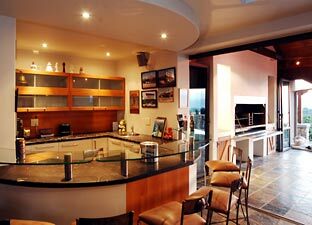 The views over the lagoon to the Outeniqua mountains beyond will take your breath away and the excellent open plan kitchen, dining and bar facilities will make eating and entertaining a total pleasure. Add the Jacuzzi, beautiful verandah, massive built-in braai and rock pool (with waterside for the kids) and you have the perfect holiday home. The owners corporate membership at both Pezula & Simola Golf Clubs offers a big advantage to guests  reserved tee-times and greatly reduced green fees at both courses! Eagle's Nest sleeps up to 12 people in 3 double-bedded rooms and 1 twin, plus 2 further bedrooms with bunk beds. The upstairs master bedroom has a kingsize bed, verandah, dressing area and ensuite bathroom with corner bath, separate shower, WC and double vanity unit. On the same floor, theres a further 2 interconnecting bedrooms (1 double, 1 twin) both with wardrobes and sharing a bathroom with shower, WC & single sink. Upstairs, on the opposite side of the house, are 2 bunk-bedded rooms with wardrobes and a shared bathroom with bath, separate shower and double sink. A further double bedroom occupies the top floor of the house, featuring built-in wardrobes and a large ensuite shower room with WC and sink. Theres also an adjoining laundry area with tumble dryer, ironing board, etc. 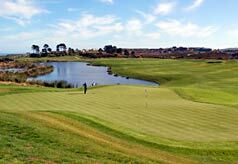 Greatly reduced green fees at both Pezula and Simola. Play often enough during your stay and the money you save could cover your house rental! The lounge area overlooks the rock pool and features leather sofa and armchairs, coffee table, TV (with DSTV), DVD player and cosy fireplace for chilly evenings. The sun-trap verandah is furnished with loungers and outdoor dining table. The massive open-plan kitchen is exceptionally stylish and well lit. The genuine Italian units and worktops feature top quality stainless steel, granite and glass finishes  very attractive and practical! Theres a side-by-side fridge/freezer, separate fridge, 5-burner gas hob, oven, microwave and a wide range of small appliances. The adjoining utility room has a washing machine, dishwasher and sink. The separate dining area (seating 6) is adjacent to the kitchen. The propertys attractive pub is at the heart of the house. Beautifully furnished with glass counter and comfortable stools, it features a bar fridge, sink, ample storage space, coffee/tea-making equipment and stylish lighting. The adjoining sunroom with Jacuzzi has fold-back glass doors. When opened, these revvveal a stunning free flow area (and views) from the bar right out to the braai area, verandah and pool. In addition to a double garage, the house offers secure parking for 2 further vehicles in its paved front courtyard. Property Management, housekeeping services, visitor attractions and activity advice. 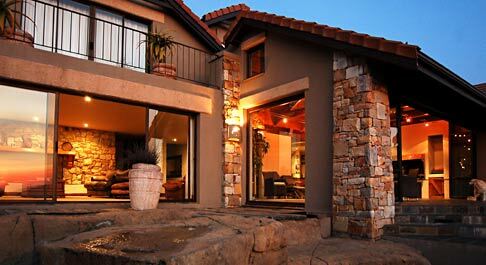 Rental of properties in Knysna, short and long term rents, care of property in owner absence, organisation of maintenance, inspection visits and reports, inventories, pool maintenance.